The Tamil National Alliance (TNA) regarded as the premier political formation of the Tamils of Sri Lanka has been very much in the news lately due to what could be termed as an internal crisis. The TNA that has in recent times been contesting elections under the house symbol of the Ilankai Thamil Arasu Katchi (ITAK)is afflicted by internal dissension among its constituent members. Of the five organisations in the political configuration known as the TNA, four have been at loggerheads with one party over what is projected as a crucial issue. Four parties namely the Tamil Eelam Liberation Organisation (TELO), Eelam Peoples Revolutionary Liberation Front (EPRLF), Tamil United Liberation Front (TULF) and Peoples Liberation Organisation of Tamil Eelam (PLOTE) want the loose formation known as the TNA to be officially registered at the Elections Commissioners Department as a single political party with a unified administrative structure. The chief constituent of the TNA which is the Ilankai Thamil Arasu Katchi (ITAK) has not been too enthusiastic about the idea, displaying marked reluctance to help implement the proposal while not dismissing it entirely. This has paved the way for some of the other TNA constituents to accuse the ITAK as being opposed to Tamil political unity and even orchestrate a media campaign against it. While leaders of the ITAK have generally been on the defensive in reacting to questions concerning TNA structural unity some leaders from other parties purporting to retain the moral high ground on this issue have been very much on the offensive against the ITAK. Foremost among these has been EPRLF leader Kandiah Premachandran known generally as Suresh Premachandran or Suresh. Internal dissension and fragmentation within political parties is not a new phenomenon in Sri Lankan politics. The United National Party (UNP), the Sri Lanka Freedom Party (SLFP), the Leftist parties from the Lanka Sama Samaja Party (LSSP) to the Janatha Vimukthi Peramuna (JVP) have all experienced such schisms. In fact the SLFP itself was a breakaway from the UNP in 1951.Even the Sri Lanka Muslim Congress (SLMC) founded by M.H.M. Ashraff to unite the Muslim community has suffered many splits. Against this backdrop it is no surprise that divisive tendencies are prevalent in the realm of Tamil politics too. Originally the Ilankai Thamil Arasu Katchi (ITAK)split from the All Ceylon Tamil Congress. Later the Thamilzhar Suyaatchi Kazhagham (Tamil Self Rule Party) broke away from the ITAK. Several MP’s have broken ranks from the ITAK, ACTC and later the TULF. Balasundaram, Sivasundaram,V. Navaratnam, C.X. Martyn, C. Arulampalam, A. Thiyagarajah, C. Rajadurai, M. Canagaretnam –the list is long. The ideal of unity remains strong in ethnic politics but in actual practice it seems impossible to achieve. The issue of unity within TNA ranks is being viewed as a new and potentially harmful development by sections of the Tamil media. The bitter reality however is that the ideal of absolute political unity has been, is and will be a mirage. Though desirable it is practically unachievable for that is the nature of things among men and matters. The TNA too has had a chequered past in this respect. When it came into being in 2001 the TNA had four constituent members. The press communique issued on October 22nd 2001 heralding the formation of the Tamil National Alliance was signed by four persons representing the Tamil United Liberation Front, All Ceylon Tamil Congress, Tamil Eelam Liberation Organisation and Eelam People’s Revolutionary Liberation Front. They were R.Sampanthan (TULF), N. Kumarakuruparan (ACTC) N. Srikantha (TELO) and K.Premachandran (EPRLF). Kumarakuruparan is now with Mano Ganesan’s Democratic Peoples Front. The ITAK was not in the picture when the TNA was formed originally. The Ilankai Thamil Arasu Katchi known as the Federal Party was then the primary component of the Tamil United Liberation Front. The ITAK or Federal party had together with three other parties formed the Tamil United Front (TUF) in 1971. The TUF was born again, a new avatar known as the Tamil United Liberation Front (TULF) in May 1976. The newly formed Tamil National Alliance of 2001 contested under the TULF symbol Sun. An unexpected turn of events resulted in the TNA being deprived of the Sun symbol. The dormant Ilankai Thamil Arasu Katchi was revived and the TNA contested under the old ITAK symbol of House or Veedu. This led to an ITAK renaissance. The details of what happened then are rather interesting. Parliamentary polls in December 2001 saw the TNA getting fifteen seats including a national list MP. The TULF President of that time Murugesu Sivasithamparam was appointed national list MP. Of the fifteen TNA seats the TULF had seven, TELO had four, ACTC had three and the EPRLF one. The TNA then contested under the aegis of the TULF. The electoral symbol of the TNA then was the Sun which was portrayed politically as the rising sun or Uthayasooriyan. It was under the Sun symbol that the TULF contested the 1977 July elections and obtained a sweeping victory winning 18 out of 19 Tamil majority electorates in the North and East. The TNA tryst with the Sun symbol had a short time span. After Sivasithambaram’s demise Veerasingham Anandasangaree became President of the TULF. Sangaree soon fell foul of the Liberation Tigers of Tamil Eelam (LTTE) in trying to assert and uphold the independence and dignity of the TULF. This led to the LTTE pressurising the TULF to remove their president from office and deprive him of his MP seat. The bulk of the TULF capitulated and Anandasangaree was removed from party office. Sangaree however went to courts challenging his removal. The TNA deprived of the Sun symbol opted for the ITAK symbol House. Thus the dormant Ilankai Thamil Arasu Katchi obtained a fresh lease of life. While Sampanthan was the President Somasundaram Senathirajah known as “Maavai” Senathirajah functioned as ITAK General Secreratary. The TULF of which the ITAK formed the core element now adopted a new course in politics. The TNA contesting under house won 22 seats including 2 national list MPs in 2004. This was mainly due to “assistance” rendered by the tigers who had established complete control over the TNA. The LTTE engaged in multi-pronged action to tip the scales heavily in favour of the TNA. Although the TNA won 22 seats its utilitary value was minimal as it had to function as a tiger mouthpiece. The military defeat of the LTTE in May 2009 was in a way a blessing in disguise for democratic Tamil politics in general and the TNA in particular. Representative democracy for Tamils was liberated from the oppressive hegemony of the LTTE. When Parliamentary polls were conducted in 2010 it was evident that the winds of change were blowing breezily in the musty corridors of Tamil politics. Some quirky developments took place. Though Eelam Peoples’ Democratic Party (EPDP) leader Douglas Devananda is fond of describing the 22 MP’s of TNA elected in 2004 as “Tiger Nominated Agents” it was not the whole truth. Eleven of the twenty-two were nominated as non party candidates by the LTTE but the other twenty-two were elected from the four political parties. It was as if the LTTE had adopted a “fifty-fifty” policy of balanced representation between its nominees and the party nominees. With the LTTE ceasing to be a dominant force some of its nominees changed stripes. Wanni district MPs Sivanathan Kishore and Sathasivam Kanagaratnam along with Batticaloa District MP Ms.Thangeswari Kadirgamar contested on the United Peoples Freedom Alliance ticket. They suffered ignominious defeat. Two Jaffna district MPs Selvarajah Gajendran and Ms. Padmini Sithamparanathan were denied nomination again. This was presumably due to their past links to the LTTE rendering them unacceptable in the newly emerging political environment. Gajendrakumar Ponnambalam of the Tamil Congress insisted upon their inclusion and broke ranks with the TNA on account of this. Together they formed the Tamil National Peoples Front and contested under the Tamil Congress symbol of cycle. All three were routed. Two MP’s from the TELO in Jaffna M.K. Sivajilingam and N. Sreekantha contested as Independents under the nomenclature of Tamil National Liberation Alliance. They too lost badly. Appadurai Vinayagamoorthy of the Tamil Congress opted to contest as part of the TNA and won. The TNA underwent defection from its ranks when Piyasena crossed over to the Government during the time of the 18th Constitutional Amendment being passed. Despite that setback the TNA has been able to maintain unity thereafter although some of its MPs are under intense pressure. An interesting feature of post - 2010 election Tamil politics was increasing pressure on the TNA to both enlarge its membership and concretise its structural unity. Parallel to this pressure was the renaissance and assertion of the ITAK while remaining within TNA folds. The mounting pressure on the one hand for the TNA to restructure itself as a single party and the determination of the ITAK rank and file to preserve its distinct identity on the other are the causes of the current intra-TNA crisis. The original EPRLF had split in three ways. Douglas Devananda was leading the EPDP. Suresh Premachandran was heading the EPRLF known as the EPRLF (Suresh)group. Former North-Eastern Chief Minister Annamalai Varatharajapperumal led a third faction known as the EPRLF(Varathar) group. Later it became known as EPRLF (Naba). Naba refers to the lovable Pathmanabha former EPRLF Secretary- General killed in Chennai by the LTTE in June 1990.With Varadarajapperumal remaining in India most of the time the EPRLF Naba faction is led by “Sugu” in Sri Lanka. In such a situation both the TULF and PLOTE were taken into the TNA. The EPRLF faction led by Sugu could not join the TNA due to stubborn opposition by Suresh Premachandran who insisted that his EPRLF was the sole EPRLF. The TNA now comprised five political parties. Meanwhile TELO dissidents Sivajilingam and Sreekantha also returned to TNA folds. Thereafter they were readmitted to the TELO. The TNA now seemed larger and stronger but actually it was weakening internally. Although the facade of Parliamentary unity is retained by the TNA, it has been assailed by internal dissension over a key issue. That this issue relates to the question of registering the TNA as a single political party is now public knowledge thanks to the orchestrated media campaign directed against the ITAK. Former armed organisations like the TELO, PLOTE and EPRLF are at times encumbered by their militant reputation and want to extricate themselves from their violent past. For them dissolution of the existing parties in favour of a greater entity is desirable. But the older and larger ITAK with its democratic roots was unwilling to lose its specific identity and formalise the TNA as a party. It prefers to function as a loose formation with unity of purpose and approach rather than setting up a “unitary”structure. It is in this situation that there is much speculation about the TNA breaking up. What is happening currently is that the EPRLF,TELO and PLOTE along with the TULF are joining forces to force the ITAK into registering the TNA as a separate party. The announcement by President Rajapaksa that elections to the Northern Provincial Council would be held in September has infused an element of urgency to this demand. It is being emphasised that registration of the TNA as a political party should be done before the Northern poll. It is even being speculated that if the ITAK remains constant in refusing to register the TNA then the other four parties would seek registration separately as the TNA and use the TULF symbol Sun instead of the ITAK house symbol. Some however do not take this threat seriously and feel it is only intimidatory politics. The reality today is that the four parties together are no match for the ITAK. The prevailing outcry over the acquisition of privately owned lands in Valigamam North and the yeoman service rendered by the ITAK in mounting a legal challenge for 1474 land owners has raised its political stock high. Besides any party or parties that break away now and form a separate entity would be perceived as a Govt lackey aiming to disrupt Tamil unity. Apart from the fact that elections to the Northern council are by no means a certainty there is also a legal hitch in registering the TNA as a political party right now. Apparently new election laws stand in the way of a new party being registered during the course of a year. It can be registered only when the Commissioner of Elections calls for applications for registration in the month of January each year.In a bid to confirm the legal position this writer sent a query by email to Lawyer and TNA parliamentarian MA Sumanthiran. This is what I asked him –“ Is it possible to register the Tamil National Alliance as a separate political party with the Elections Commissioner before the Northern Provincial council polls are held in September as announced? What is the correct legal position on this? This being the exact legal position regarding the possibility of registering a new political party the ITAK is somewhat relieved of acute pressure to register the TNA immediately. This does not mean the crisis has blown away. It would always be there and resurrected at opportune times to pressurise the ITAK. What is not realised except by a perceptive minority is that the pressure on the ITAK to “unite” in the name of greater Tamil solidarity is actually part of a sinister plot to undermine the ITAK under the Sampanthan-Senathirajah leadership and reduce it to subordinate status. There is an extremist lobby amidst the Tamil Diaspora that wants the ITAK and by extension the TNA to follow a hawkish suicidal course in politics. The idea is to plunge the Tamils of Sri Lanka into dire distress by compelling its chief democratically political representatives into adopting a hard line. What some of these Diaspora elements have been trying to do in the past has been to prop up the “Thamil Thesiya Makkal Munnani”(Tamil National Peoples Front) as the premier representative organisation of the Sri Lankan Tamil people. The Sri Lankan Tamils have thwarted these plans by consistently rejecting the Diaspora favourites at polls and opting for the comparatively moderate ITAK-TNA. The pressure on the ITAK in the name of Tamil unity is aimed at whittling down its political clout. While Suresh Premachandran of the EPRLF spearheads the onslaught on the ITAK from within the TNA for his own objectives, masterminds of the so-called “Tamil Civil Society” mount a campaign from outside for their own purposes. There is a subtle alignment between key figures of the civil society movement and Tamil National Peoples front-Tamil Congress in order to diminish the importance of the ITAK and reduce it to a state of political impotence. Unfortunately some eminent Tamils have let themselves be misguided and manipulated by these opportunists into subscribing to unrealistic demands without realising their implications.Three of the demands made upon the TNA in the name of greater Tamil unity serve to illustrate the nature of this anti-TNA exercise. 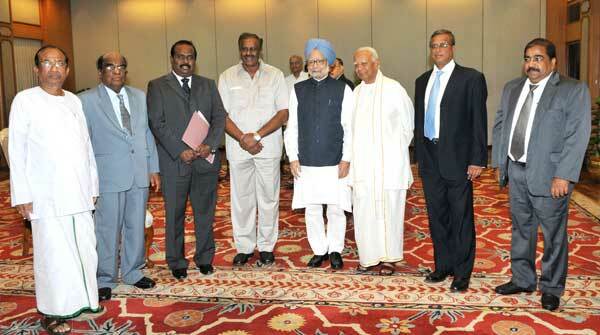 One is the call to set up a Tamil National Council. The other is the call for the TNA to boycott the forthcoming Northern poll and instead let an Independent list comprising “civil society” representatives to contest. The third is for the TNA to return to a pre-May 2009 political position.On the other front, Suresh Premachandran seems to be having another separate agenda. His intention it appears is to corner the ITAK from within TNA folds by ganging up with the other TNA constituents. If and when the TNA is concretised as a single party structure it would be easier to launch an insidious campaign from within.Premachandran is said to be aiming at the TNA leadership by conducting a vicious campaign against Sampanthan. He sees the genial Senathirajah as a pushover despite Maavai’s political seniority. A short term objective of Premachandran is to either vie for Northern chief ministership or make his brother the TNA chief ministerial candidate for the north. Thus it could be seen that there is a convergence of interests between some internal components of the TNA and some external elements in downsizing the ITAK. The redeeming feature for the Thamil Arasu Katchi in this gloomy scenario is the fact that there is no identity of interests between both groupings. Nevertheless the current situation is one where the TNA in general and the ITAK in particular are facing a crisis both within and without. This does not necessarily mean that the ITAK is a sitting duck for these disparate elements to target easily. There is a wealth of experience, talent and political acumen within its ranks. Also some other constituents of the TNA are having second thoughts about the hidden agenda of fellow constituents. Likewise many are beginning to question the politics of the Gajendran-Gajendrakumar duo and segments of the civil society movement. These developments in turn are paving the way for an effective counter strike by the ITAK. It appears that the ITAK would be able to consolidate its position within the TNA and withstand the internal and external political assaults. How and why this political scenario is evolving requires a more detailed description and analysis in a future article.